Dean first met Chris at a competing sign shop in Danbury, Ct. …that was 1990.They soon married and Chris became a part of the Lawrence Team that still, to this day run the family business. She brings to the business, her own unique Artist talents and Sign making experience. She learned her trade at numerous Sign Shops, being on the ground floor of Computer Sign Making Equipment. She actually field tested the first systems, and helped in their development. Skilled at hand lettering, Chris is also a award winning pencil portrait artist, earning awards and having her work displayed in Galleries. Her Portrait of the Who rock band’s bass player, John Entwhistle, hung in his home in England. Chris is adept at Graphic Computer programs, handling much of the print layouts the shop prepares. She is capable of, start to finish Sign production from initial design creation to all production methods .The two collaborate on many jobs with each contributing their personal talents. The old cards tell the story from the first “Dino” nickname, Dean Lawrence gave to himself in 1966 to the present day. He was “Dino the Weirdo painter” in High school, taken from Ed ‘Big Daddy” Roth’s hot rod Weirdo Shirts .It was the ‘Swinging Sixties”, and pinstripe and letter Hot Rods and Custom Cars after School. Growing up in the Westchester County suburbs of New York City, weekends found him at his home track, Dover Drag Strip. There he’d go from car to car applying his designs with paint and brush. 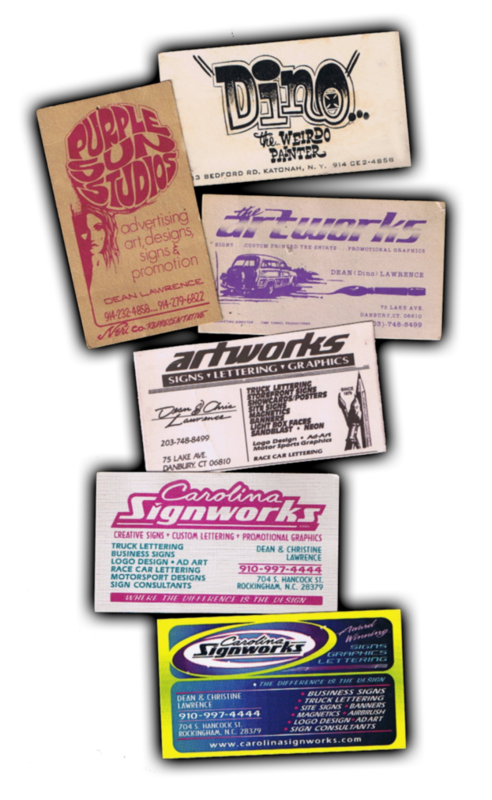 So started a career in Signs, Lettering, Motorsports Graphics and Logo Design, spanning over 45 years..His Current Carolina Signworks in Rockingham, N.C. was opened in 1993, after operating Artworks Signs & Graphics, in Danbury, Ct. for 13 years. His Art background is diverse and lends knowledable experience in consulting small businesses in visual promotion and marketing. He majored in Advertising Art and Graphic Design at New York’s prestigious School Of Visual Arts. His Resume includes positions as Marketing Director for Dover Drag Strip, Art Director and Owner of his Ad Agency; Purple Sun Studios, Various Public Relations and Advertising Managerships at Restaurants, Rock Clubs, and Custom Vans Inc. He has over 150 Awards ranging from Commercial Vehicle Lettering, Pro Motorsports Graphics, and Best Appearing Car Awards for his paint schemes, custom paint and lettering In NHRA, IHRA, NASCAR and even Monster Trucks. His work has been showcased in publications including Sign Craft Magazine, Sign Business Magazine with two covers, Auto Art Magazine and seven 1st, 2nd & 3rd place awards In Sign Business Magazine’s annual Auto Art Contest, against the best in the world. Before computers, Dean created every project by hand .This Sign Artist background puts his creativity well beyond the current capabilities of most sign shops .Correct color theory, Sound Design, Type face philosophy are all utilized for his striking compositions. Subscribe to our newsletter and receive exclusive updates and discounts!